Easter Sunday with the boys was so much fun! They were so excited to get a visit from the Easter bunny which included baskets filled with candies, toys, and clothes and a new stroller from the grandparents! Celebrations started Saturday at home and continued into Sunday with cousins and family. The weather was sunny and warm and it was the perfect time to wear some new spring clothing. I loved having the boys in matching outfits, and we all wore a fun springy color...pink! 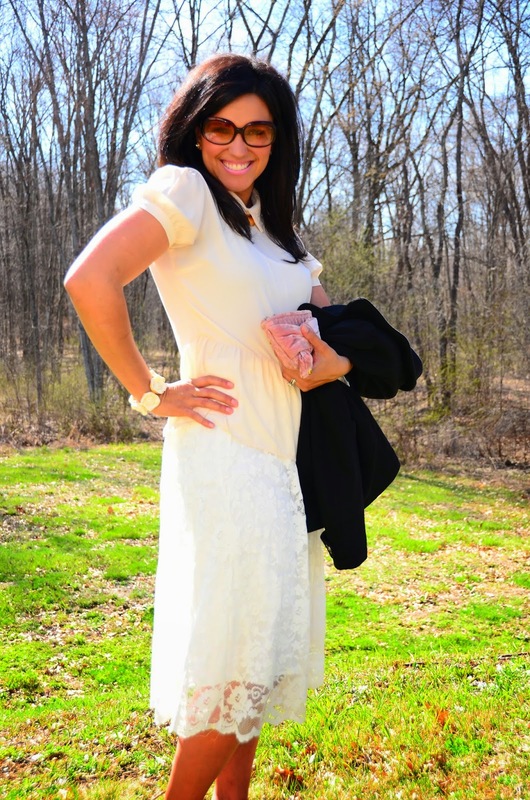 I wore a white lace midi skirt which I know I will wear all summer long. I love white lace for spring and summer, and this feminine blouse, jewelry and heels were perfect to wear with it for the holiday. But, I can't wait to wear this skirt again with a t-shirt and sandals and a denim shirt and booties. Hope you all had a nice holiday with your family and friends!